"Law and Ethics for Medical Careers, 4th edition," provides an overview of the laws and ethics you should know to help you give competent, compassionate care to patients that is within acceptable legal and ethical boundaries. The text can also serve as a guide to help you resolve the many legal and ethical questions you may reasonably expect to face as a student and, later, as a health care practitioner. The text features pertinent legal cases, anecdotes, and sidebars related to health-related careers. 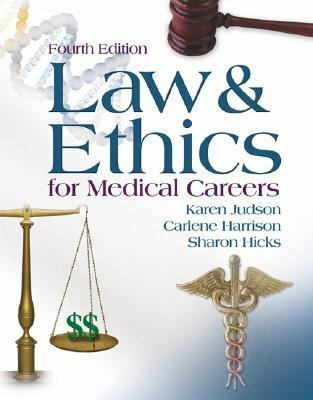 Content has been updated and special attention has been paid to legislation affecting health care.Judson, Karen is the author of 'Law & Ethics For Medical Careers ', published 2005 under ISBN 9780073022635 and ISBN 0073022632.